“He grazes much but produces no wool.” —Cecil D. Elliott on academic productivity. Infamously, Lafayette Ron Hubbard—yes, the “L” stands for Lafayette; would Scientology have caught on if he’d kept it?—once quipped that it would be easy to fabricate a religion. A creepy observation on my part as I prepare to spend eleven weeks in Belgium, which has just criminalized Scientology. Enough said. I blogged here some months ago about our friend Cecil Dean Elliott, chair and faculty-colleague at the Department of Architecture and Landscape Architecture. Cecil was supportive of all my research activities and rarely expressed concern over the discrepancy in my work habits between productivity and product: I can and do investigate a topic to death (and very likely until death), yet never seem to bring the disparate, divergent threads of each project to any degree of fulfillment. The frayed edges of the fabric are always more interesting than the density and uniformity of its weave. You mentioned a less than complementary appraisal of your professional output … foraging widely and producing little wool? This metaphor is predicated on the assumption that you ought to be a sheep … you are not a sheep, you are a goat. Goats are independent by nature and curious, thus less inclined to herd behavior. Goats are able to survive and thrive in the wild … to my knowledge, there are no sheep outside of domestication. Some goats offer wool, others milk and cheese. Be proud of your goatliness. This random, delayed response was brought to you by an afternoon of driving around town, and sanding the trim and casement in my porch for painting. Too bad this person never met that person. To write in praise of goats will appear self-serving, since I will seem to be claiming for myself those admirable behavioral traits. What the sheep-versus-goat observation did, however, was stimulate my ongoing fascination with religion. How (I inquired rhetorically) would Christianity have developed if Jesus had tended goats as a young man, rather than sheep? 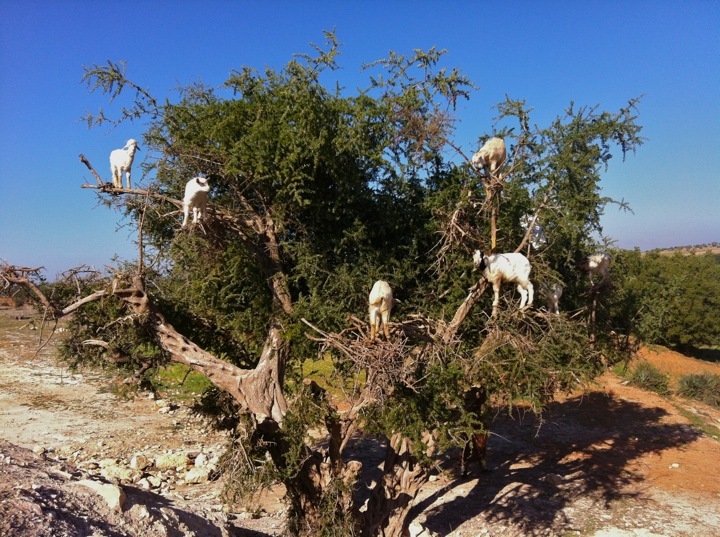 Shepherds can be “good”, but so can herders of goats. It is my intention during the next few months to re-write portions of the New Testament from the perspective of goat-ishness and to imagine the trajectory of a very different dispensation. Happily—for the time being, at least, until the Tea Party makes heresy a punishable crime—I can do this in America. Is it worth noting that there are only two letters separating “heresy” from “hearsay”? PS: Look at the goats in the pic up top! Sheep are disinclined to do anything like that, while goats seem forever “on point”. By agincourtiowa in Real People, Uncategorized on Sunday/12/January/2014 .